Since 1947, Geiger Tool & Manufacturing Company has focused on machining and value engineering for electronics, medical devices, aerospace, micro electronics and general commercial applications. Just after the end of World War II, William Geiger opened the doors at Geiger Tool & Manufacturing Company. In 1973 after 26 years of success and growth, he passed the operation on to Jim Nogrady, today’s President. 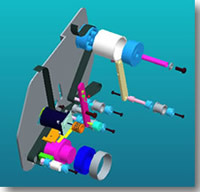 Shortly thereafter, the Computerized Numerical Control (CNC) revolution began and the automation modernization of the machine shop was underway. Recognizing the improved quality and productivity of CNC, Geiger Tool moved steadily to update and maintain technical superiority over its competition. As a result of continued growth, the facility was more than doubled in size in 1983. Today’s 20,000 square foot building houses 13 CNC machines covering all applications. Additionally, dozens of traditional machines are available providing operations of infinite capability. The Production Center, Quality Assurance office and administrative operations are also included within. Assemblies, sub-assemblies and individual pieces from Geiger Tool can be found in many of today’s civilian and military aircraft and components specifically manufactured for use on ships, submarines and tanks. Geiger also has broad experience machining the exotic materials used in sputtering targets for the silicon wafer chip industry as well as the cooling plates to service these complex application operations. For the last 30 years, Geiger Tool has been the leading designer and manufacturer of proofing presses with customers around the globe. Our line includes the Geiger Gravure Proofing Press, Geiger Production Press, Geiger Laboratory Printing Center and the Geiger Combo Gravure - Flexographic Proofing Press. Geiger also has extensive operations in Aircraft Starter and Generator Coils for midsize and large generators. Though many mergers/acquisitions have occurred, Geiger’s relationships have endured. They included; Honeywell, Bendix, ITT, Verizon, Allied Signal, AT&T, AVCO-Lycoming, IBM, PraxAir, General Dynamics, Boeing, Raytheon and many more. We pride ourselves on the ability to work in a strategic alliance with our customers and suppliers. This teaming approach assures the clearest understanding of project requirements while providing the highest quality final product. Our world-wide printing press customers include Weyerhouser, American Greeting, Olivetti, Avery, Dow, BASF, 3M, Mobil, Goodyear, Monsanto, Tintas, PPG, Europa Carton, Proctor & Gamble and Celanese to name a few. As a specialty production shop, we have been spared the sharp ups and downs of the economy by putting in place state-of-the-art equipment, fully trained personnel and in-house intelligence to produce steady growth. Today, while the off-shore movement of jobs lies primarily with those in large corporations and Washington D. C., the boutique shop that is quick to respond with value engineering, smart production and an old-time ‘can do’ attitude becomes a mainstay of our industry. Geiger Tool is just such an organization.